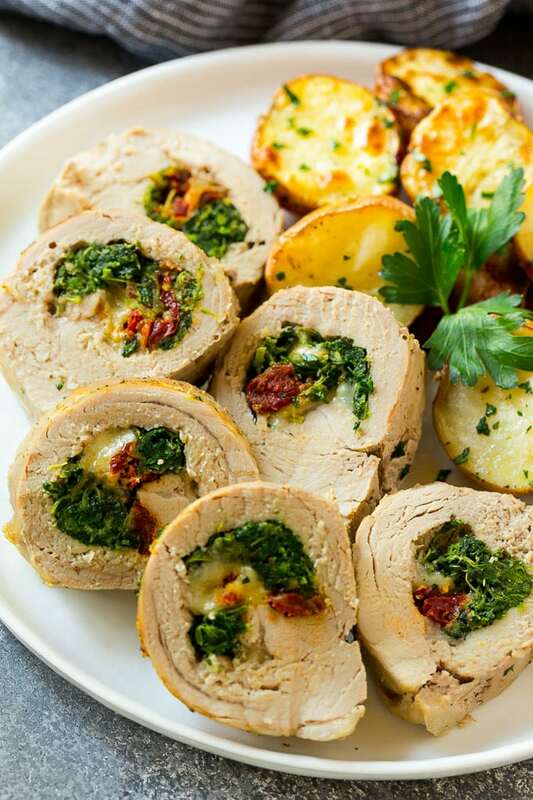 This stuffed pork tenderloin is filled with spinach, cheese and sun dried tomatoes, then rolled up and roasted to perfection. An elegant meal that’s actually quite simple to make! Pork tenderloin is perfect for an easy dinner, but when you butterfly it and stuff it with a delicious filling, it gets even better. Add some potatoes to your roasting pan and you’ll have a complete meal! I always keep a pork tenderloin in my freezer. They’re flavorful, tender, inexpensive and the perfect neutral base to layer on the flavors. 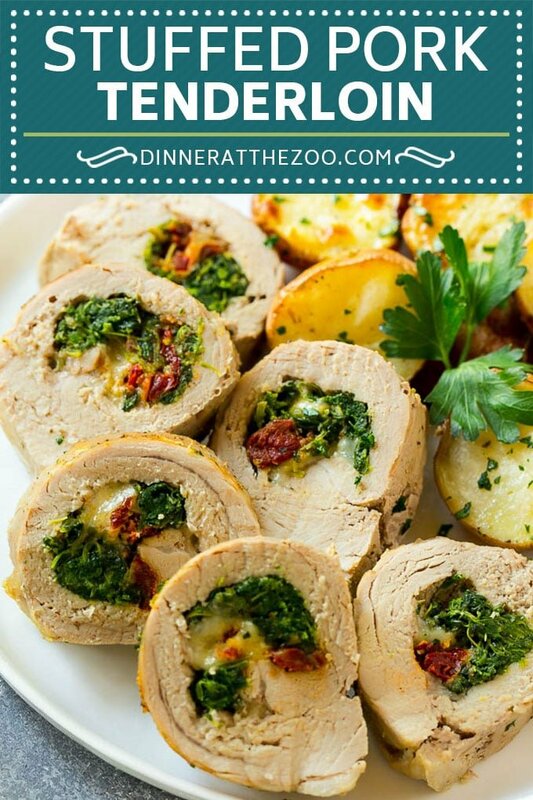 This stuffed pork tenderloin is a family favorite, it’s full of savory Italian flavors and looks fancy too! 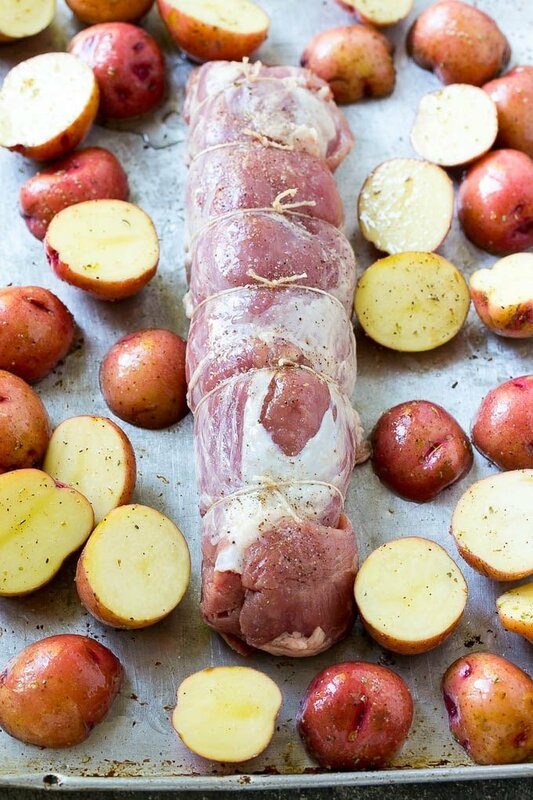 How do you make stuffed pork tenderloin? The first thing you’ll need to do is butterfly your meat. Make a cut down the length of your pork tenderloin, but don’t cut all the way through. The pork is then laid open like a book and pounded thin with a meat mallet. I place a piece of plastic wrap or parchment on the surface of the meat so that it doesn’t tear when I pound it thin with a meat mallet. After your pork has been butterflied, it gets filled with a savory stuffing of thawed frozen spinach, sun dried tomatoes and mozzarella cheese. You can get creative here and vary up the filling depending on your mood and the ingredients you have on hand. Other great choices are fontina cheese, feta cheese, marinated artichokes, olives or sauteed mushrooms. After your filling is in your pork, it’s time to roll it up and tie it with some kitchen twine. I add some small potatoes to my roasting pan to make it a complete meal. You could add other sides to the pan such as carrots, sweet potatoes or even cubed butternut squash. 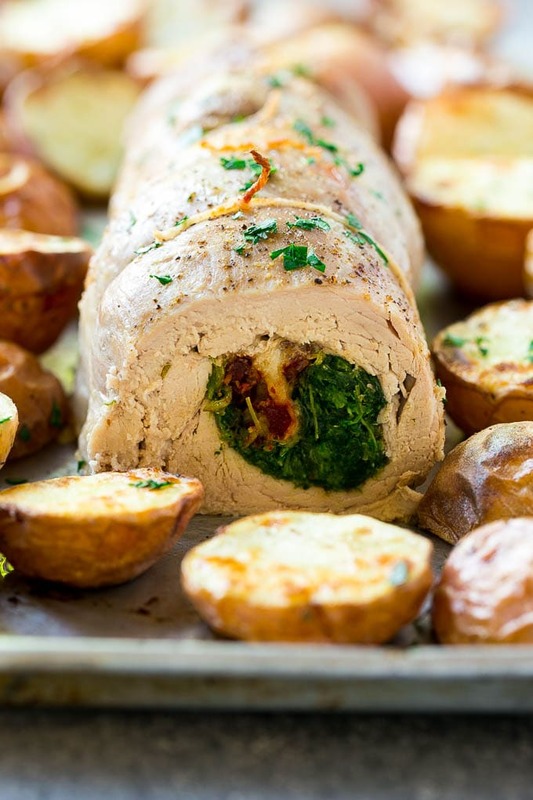 How do I cook a stuffed pork tenderloin? For this recipe, I recommend roasting your pork tenderloin. It’s the best way to ensure the meat cooks through evenly and it’s so convenient because it’s a hands off cooking method. You can also saute your pork tenderloin in a skillet or grill it if desired. 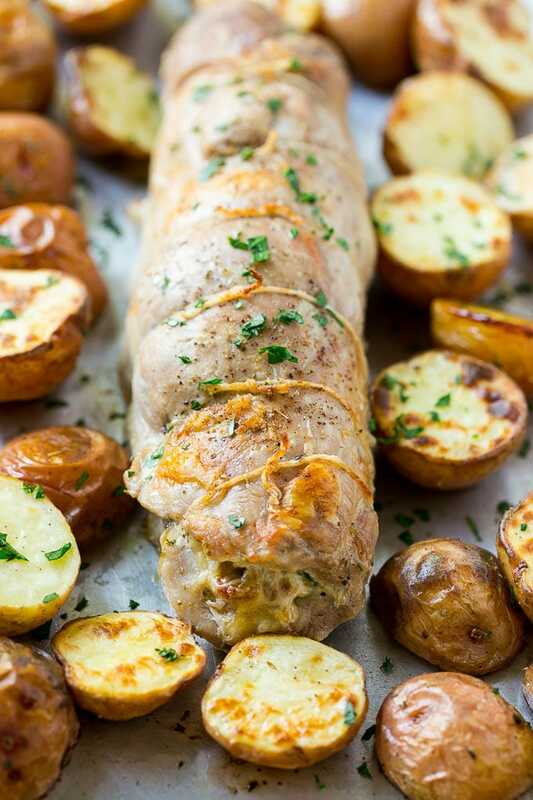 How long do you cook a stuffed pork tenderloin? An average sized pork tenderloin (approximately 1 1/4 pounds) will take about 30 minutes to cook in the oven. You can choose your desired level of doneness by checking the thickest part of your pork with a kitchen thermometer. You want the pork to be at least 145 degrees F for a slightly pink center, up to 160 degrees F for a more well done tenderloin. My whole family adores this recipe, and I love how easy it is to customize the fillings and vegetable side for a simple one pan dinner. I participated in the National Pork Board Porksgiving program as a member of One2One Network. I received compensation but all opinions are my own. 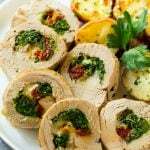 This stuffed pork tenderloin is filled with spinach, cheese and sun dried tomatoes, then rolled up and roasted to perfection. An elegant meal that's actually quite simple to make! Preheat the oven to 400 degrees F. Line a sheet pan with foil and coat it with cooking spray. Cut a deep slit all the way down the length of the pork - do not cut all the way through. Lay the pork open like a book and pound to approximately 3/4 inch thick with a meat mallet. Sprinkle the Italian seasoning, salt and pepper over the pork. 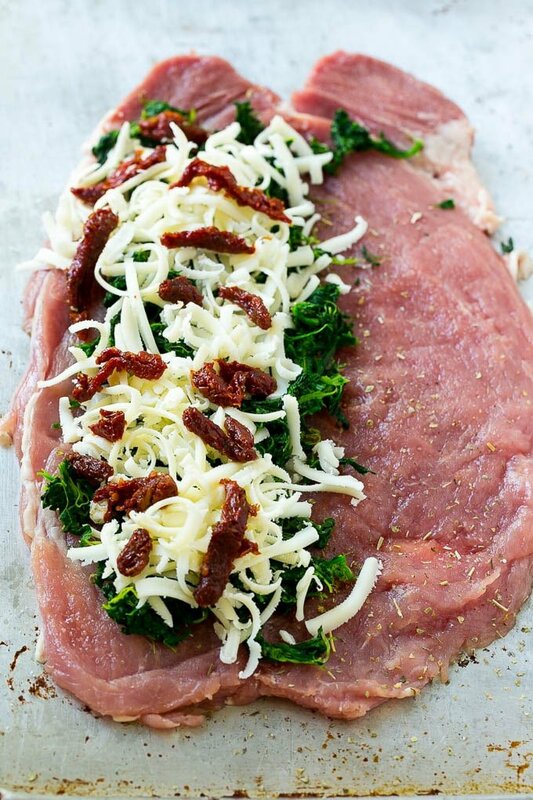 Layer the spinach, cheese and sun dried tomatoes over one side of the pork. Roll the pork up tightly and secure with lengths of kitchen twine - tie each string about 2-3 inches apart. Season the outside of the pork generously with salt and pepper. Place the pork on the lined sheet pan. Place the potatoes in a bowl. Add the olive oil to the bowl; toss the vegetables to coat and season to taste with salt and pepper. Place the potatoes on the sheet pan around the pork. Place the pan in the oven and cook for 30 minutes or until potatoes are browned and tender and the internal temperature of the pork reaches between 145 degrees F. (medium rare) and 160 degrees F. (medium), on a meat thermometer. Remove pork from heat and let rest for 5 minutes. Remove the string and slice the pork. Sprinkle with parsley and serve immediately with the potatoes. This post was originally published on November 3, 2015 and was updated on September 2, 2018 with new content. Very tasty!! Our family loved it. Thanks for sharing this Sara! My cousins will be visiting me at my crib next month and I am checking what to prepare. I guess this would be a great one to add on my menu. Glad I came over this post. Yay! Though I don’t eat pork, I could not but notice the presentation. It looks so nice and colourful. Will share this recipe with a few friends who would love it. I have never made pork tenderloin before and the fact that yours is stuffed with ultimate deliciousness is just making my mouth water! I need to try this for myself. That looks amazing! It would be nice to make this when you’re having people over for dinner. The prep’s not that difficult as well, which makes it awesome! THis looks crazy good and oh, so fancy! I would love to serve this to my friends at a dinner party!! If that tastes half as good as it looks it will be amazing. It looks so tender and tasty. This looks like a great meal and you make it seem so easy to prepare. Yes please! I’ll have to try this out for dinner one night for sure. I bet everyone in my family will gobble it right up. That looks so amazing! I could totally make this for dinner. My son wouldn’t eat it, of course, because he’s still in the picky stages, but my husband would love it. Yummy! This recipe looks so savory and delicious. Looking forward to making this for my family. This pork is amazing! I made it for some friends and everybody loved it. This sounds so delicious!! Love all the flavors you have incorporated here! And your pictures are gorgeous! I love this idea for so many reasons. We had a wonderful lady who was family to us, and we used to cook for her whenever possible. Such a lovely thing that so many more could be doing that reflect this great “pay it forward” idea. I love a stuffed pork tenderloin. Perfect fall flavors. I love this time of year! Sharing a meal is such a nice gesture and always appreciated. I have never thought to stuff pork tenderloin – it looks so easy! Cooking it with veggies is such an easy way to make a complete meal.